Using a dash cam in your car has been popular in many parts of Asia and Europe for years, but they are starting to catch on here in North America in recent years. 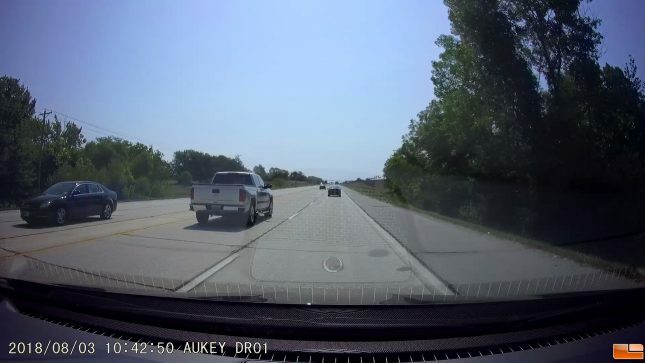 Dash cam footage could protect you from someone trying to file a false insurance or accident claim against you or make you the next viral media star if you capture something epic while driving around. Traffic deaths on U.S. roads reached an estimated 40,100 in 2017 according to The National Safety Council and motor-vehicle injuries in 2017 impacted 4.57 million people. The estimated cost of vehicle deaths, injuries and property damage was estimated around a mind staggering $413.8 billion. 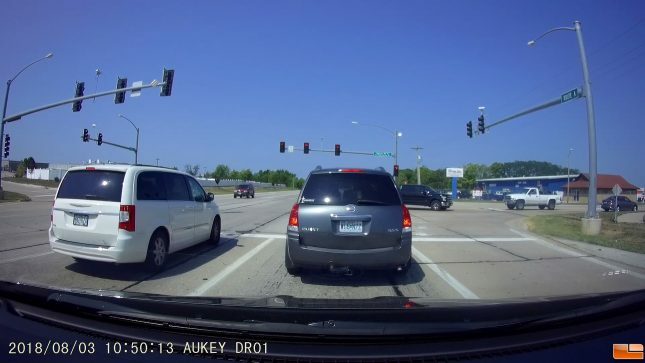 Having an always on dashboard-mounted video camera was something that only the police did, but dash cams have become really inexpensive in recent years. You can purchase a Full HD 1080P dash cam with a Sony Exmor IMX323 Sensor, 170° wide angle lens, and 2-inch LCD for under $60 these days. Today we’ll be taking a look at the AUKEY Dash Cam DR01 that is available from Amazon for $57.99 shipped. This is a rather inexpensive model, so it will be interesting to see how it performs. 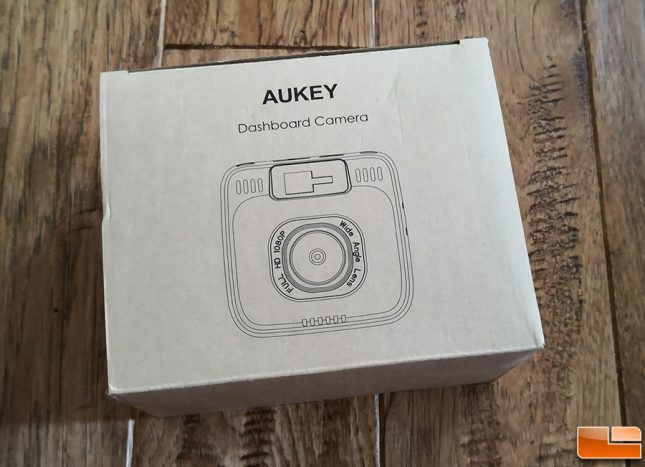 The AUKEY Dash Cam DR01 comes in simple low-cost recyclable cardboard packaging. Inside the box you’ll find the AUKEY DR01 Dashboard Camera, Dual-Port USB Car Charger, USB Mini-B Power Cable (4m/4.37yd), Sticker Mount, Three 3M Stickers, Six Cable Clips, User Manual and a card that discusses the 45-Day Money Back Guarantee as well as the cameras 24-Month limited warranty. If you want to enable GPU you’ll need to connect your GPS antenna of choice to the 3.5mm input along the top edge of the dash cam. Something like the PAPAGO! Dashcam GPU Antenna ($34.99 shipped) would work if you need one. 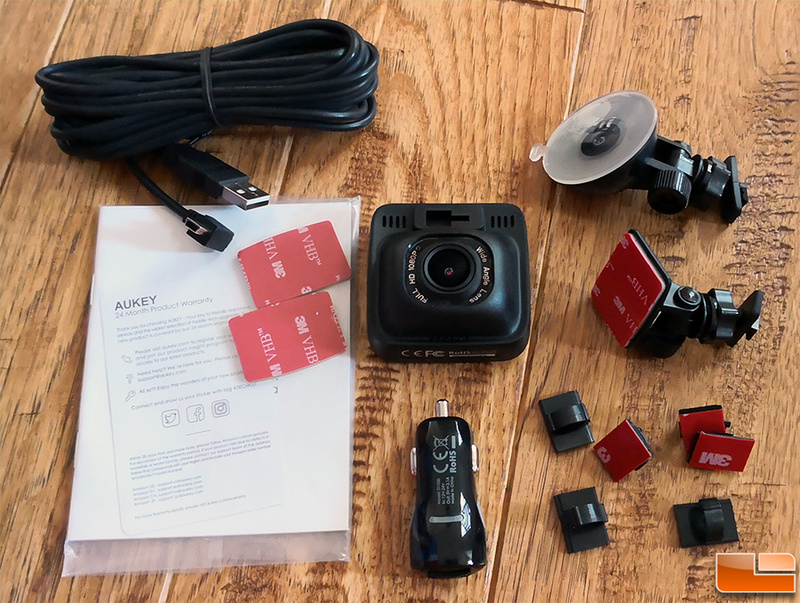 Setting up the AUKEY Dash Cam DR01 is about as simple as it gets. It defaults to Full HD 1080P resolution (1920 x 1080) and the audio is disabled. You can go through the menu and customize what settings are available if you like. The one thing we noticed is that you do need to use the FORMAT option on a microSD card before using the camera. We also noticed with this continually recording camera is that it doesn’t record continuous video. It records clips that are either 1, 3, or 10 minutes long. After setup we got an error that card needed to be formatted as the custer size was wrong. We were using a brand new Samsung PRO Endurance 128GB MicroSDXC memory card (read the review) designed for 24/7 recording, so we went back into setting and formatted the card and the camera started recording. You’ll want to use a good microSD card as dashcams are constantly writing data to the card and cheap models with low endurance ratings will fail sooner than the higher-end cards with longer endurance ratings. It will take longer to route the USB power cable than setting the camera up! Once the camera is setup it will automatically record when the power source is turned on and then shuts down when the power is cut. 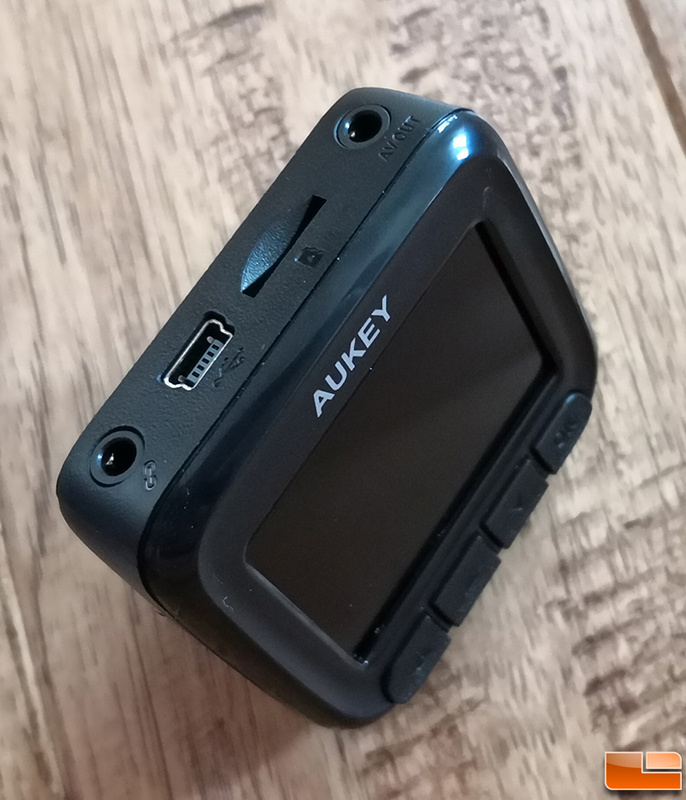 The AUKEY Dash Cam DR01 uses around 300mA from the 5V power source, so you could use a portable battery pack to power this camera. This means it can be used in a wide range of applications beyond just vehicles. 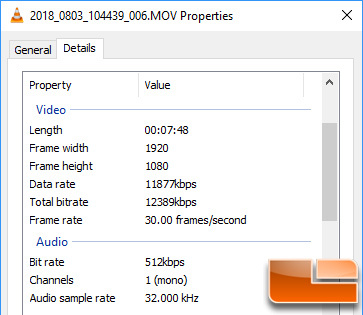 The 1920 x 1080 resolution video files are saved in .MOV format at 30 frames per second and the audio is saved in 1 channel (mono) at a bit rate of 512kbps. Our 128GB microSDXC memory card gets about 20 hours of continual recording on it, which is plenty. AUKEY recommends a Class 10 microSD card up to 128GB in size and you’ll need to purchase one separately as a microSD memory card is not included. It should be noted that you can lock a video to prevent the current video clip from being over written during a loop recording, which is nice. The operating temperature range for the DR01 is between -30°C – 75°C (-22°F – 167°F), so it should hold up okay in hot areas. The 1080P video quality is very good thanks to the Sony Exmor IMX323 sensor. You can make out license plate numbers close to you, but the ones far away will still not be readable. If you can read the licence plate in real life the camera will be able to as well. 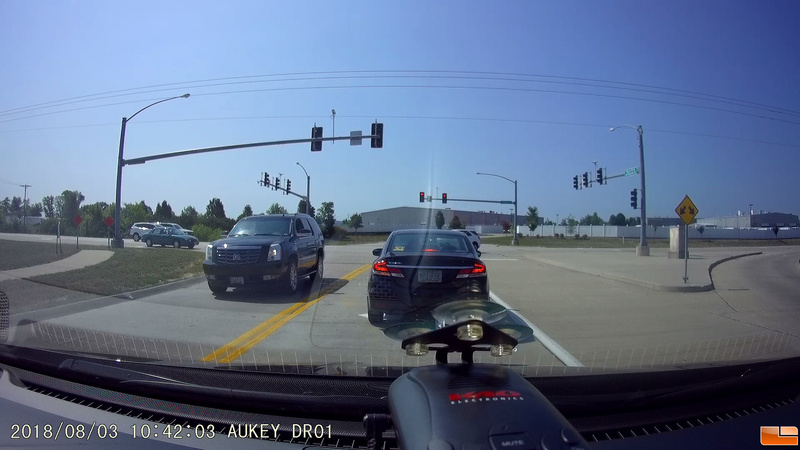 The wide angle lens does a good job at covering the entire intersection, which is great for capturing cross traffic. The camera also does well on 4-6 lane roads. The f-stop on the lens is f/1.8 for those that are curious. We suggest trying the camera at the default setting of 1080p at 30 FPS and then again at 720P at 30 FPS and see which mode you like better. The video is smoother at 60 fps, but your resolution is only 1280 x 720. This dash cam also has a collision sensor (activated by sharp turns and stops), but thankfully we weren’t able to test that feature. 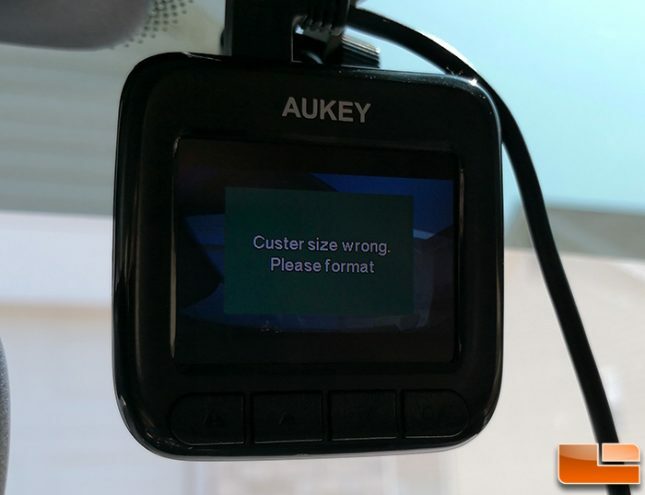 The AUKEY Dash Cam DR01 is simple to use and very easy to install thanks to the included suction cup or double-sided 3M tape mount. The video quality is acceptable for a 1080p dash cam and you get true highway width coverage. For $57.99 shipped, the AUKEY Dash Cam DR01 won’t break the bank and will allow you to capture footage of dangerous driving behavior or accidents. You can then use the video to protect yourself or it might be useful to local authorities investigating other crimes. Dash cams have been known to capture the unexpected meteorite among other things, so they are useful. The only things missing from this model is an internal battery and a GPS antenna. If those are must have features for you, then you’ll need to pay a little more for a model that has those features. The only gripe we have with the design of the AUKEY Dash Cam DR01 is that they microSD slot is on top of the camera and the USB power cable is routed over it. This makes it tricky to get the card in and out, but hopefully isn’t something you’ll need to do often. Drive safe folks! Legit Bottom Line: You stick it on your window, plug it in and it record 1080p 30 FPS video directly to a microSD card on a continuous loop. 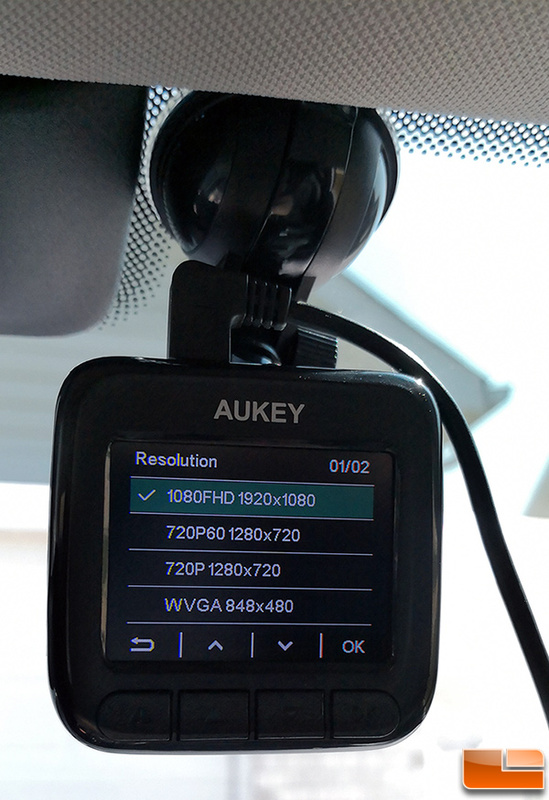 The AUKEY Dash Cam DR01 does just that and for under $60.